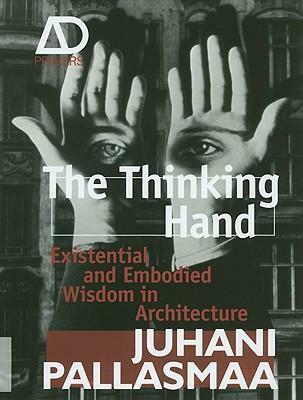 In this book Pallasmaa progresses his case for a multi-sensory approach to architecture, espoused in The Eyes of the Skin , by taking a wider view of the role of embodiment in human existential reactions, experiences and expressions as well as the processes of making and thinking. ' The Thinking Hand ' is a metaphor for the characteristic independence and autonomous activity of all our senses as they constantly scan the physical world. Many of our most crucial skills are internalised as automatic reactions that we are not consciously aware of. Even in the case of learning skills, the sequence of movements in a task is internalised and embodied rather than understood and remembered intellectually. Prevailing educational philosophies continue to emphasise conceptual, intellectual and verbal knowledge over this tacit and non-conceptual wisdom of our embodied processes, which is so essential to our experience and understanding of the physical and the built. Introduction: Embodied Existence and Sensory Thought. Chapter One: The Mysterious Hand. The Multiple Essence of the Hand. What is the Hand? Hand, Eye, Brain and Language. Hand as Symbol. Gestures of the Hand. Language of the Hand. Chapter Two: The Working Hand. The Hand and the Tool. The Hand of the Craftsman. Collaborative Craftsmanship. Architecture as Workmanship. Chapter Three: Eye-Hand-Mind Fusion. Experimentation and the Art of Play. Skill and Boredom. Eye, Hand and Mind. Chapter Four: The Drawing Hand. Drawing and the Self. Tactility of Drawing. The Computerised Hand. Primacy of Touch: Hapticity of Self-image. Unconscious Touch in Artistic Experience. Chapter Five: Embodied Thinking. Creative Fusion. The Work of Thinking: The Value of Uncertainty. Resistance, Tradition and Freedom. Thinking Through the Senses. Embodied Memory and Thought. Existential Knowledge. Chapter Six: Body, Self and Mind. The Body as Site. The World and the Self. The World and the Mind. Existential Space in Art. Chapter Seven: Emotion and Imagination. Reality of Imagination. The Gift of Imagination. Reality of Art. Art and Emotion. Artistic Experience as Exchange. Chapter Eight: Theory and Life. Theory and Making. Opposition of Theory and Making. Architecture as Image of Life. The Task of Art. Index. Photo Credits. Juhani Pallasmaa is one of Finland's most distinguished architects and architectural thinkers. His previous positions include: Rector of the Institute of Industrial Arts, Helsinki; Director of the Museum of Finnish Architecture, Helsinki; and Professor and Dean of the Faculty of Architecture, Helsinki University of Technology. He has also held visiting professorships in several universities internationally. Pallasmaa is the author/editor of 24 books, including The Eyes of the Skin: Architecture and the Senses (Academy, 1995 and John Wiley & Sons, 2005), The Architecture of Image: Existential Space in Cinema (Helsinki, 2001) and Encounters (Helsinki, 2005).